To cope with the increased level of customers wanting to collect their orders directly, Better Bathrooms have announced extended opening hours of their sales counter and warehouse, with collections now available 6 days a week. At any one time, Better Bathrooms holds up to £7.5 million worth of stock in the 100,000sqft warehouse. As part of an ongoing commitment to improve the level of service offered to their customers, Better Bathrooms has today announced that it is to extend the opening hours of its warehouse and sales counter. 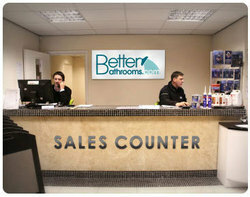 After opening the sales counter in 2007, Better Bathrooms has seen the demand for customer order collection rise significantly. A number of factors are likely to have contributed to this, not least the company’s rapid growth during the past 3 years. Since the counter opened, the retailer has taken on 2 new showrooms in Warrington and Manchester and still retains its original store in Wigan. With the warehouse and counter located in Glazebury, Warrington, it is central between the 3 stores and is perfectly placed to attract customers from all of the showrooms. At any one time, Better Bathrooms holds up to £7.5 million worth of stock in the 100,000sqft warehouse. This means that its customers can view and purchase their bathroom products in store and collect them the same day, something many of the larger high street home improvement stores would be envious of. This ready availability of stock, is one of the contributing factors which has seen the retailer go from just 20 collections a week, to being able up handle up to 1000 collections a week, and is the prime reason why the opening hours have now been extended. The warehouse and counter is now open from Monday – Friday from 8am, right through to 5:30pm and also now on Saturdays, from 8am to 3:30pm.